At the same time, there has been a renewed focus on energy-efficient electricity distribution in the state, with the state legislature and Governor Quinn currently in talks to deliver a final bill to regulate energy utilities. Perhaps no building category in the state will be more affected by these proposed regulations than warehouses, due to the immense scale of Illinois warehouse square footage. In order to make the most energy-efficient use of their warehouse space with the best economic return, warehouse owners in the state will want to reach energy efficiency targets that will qualify their properties for federal and state EPAct tax deductions. Pursuant to Energy Policy Act (EPAct) Section 179D, Illinois warehouse owners making qualifying energy-reducing investments in their new or existing locations can obtain immediate tax deductions of up to $1.80 per square foot. There are multiple 30% or 10% tax credits available through the American Recovery and Reinvestment Act to Illinois warehouse owners for a variety of alternative energy measures, with varying credit termination dates. For example, the 30% solar tax and fuel tax credits expire January 1st 2017 while the 10% Combined Power tax credit also expires January 1st 2017. The 30% closed loop and open loop biomass credit expires January 1st, 2014. Illinois is integral to the meatpacking and distribution industries because of the state’s prominent place at the center of the nation’s commodity trading, particularly in foodstuffs and industrial equipment. Thus, Illinois is a gateway for meatpacking, food processing, manufacturing, and order fulfillment, requiring vast amounts of warehouse square footage. Further, Illinois is centrally located between the East coast and Midwest, meaning that the state is a corridor for trade not only within the state but for the entire country. Illinois’ central location makes for a substantial warehousing base that is primed for large tax savings. 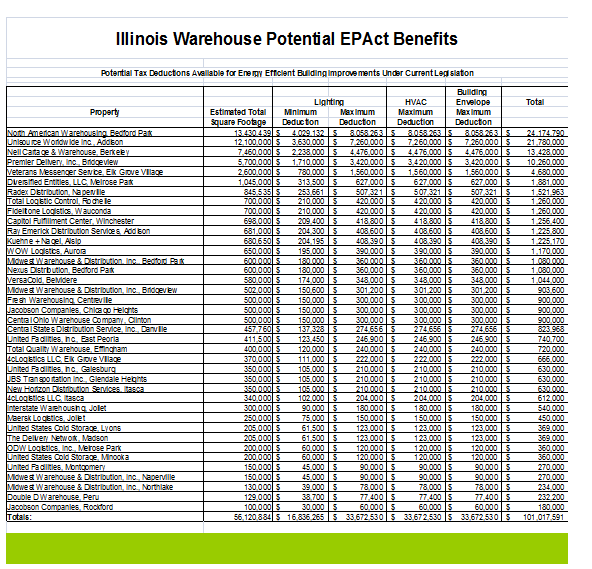 In order to effectively capture the full EPAct tax savings, Illinois warehouse owners will need to concentrate on upgrading the building’s lighting, HVAC, and building envelope in addition to considering alternative energy generation to qualify for tax credits. Building lighting comprises a large portion of warehouse energy use. Most warehouses that have not had a lighting upgrade to energy-efficient lighting in the last 7 or 8 years utilize prior generation metal halide or T-12 fluorescent lighting. It is also important to realize that effective January 1, 2009 most probe-start metal halide lighting may no longer be manufactured or imported into the United States and effective July 1, 2010; most T-12 lighting may no longer be manufactured or imported into the United States. This means that warehouses that still have this lighting technology will soon be subject to large price increases for replacement lamps and bulbs. This prior generation T-12 and metal halide lighting is very energy inefficient compared to today's T-8 and T-5 lighting, and a lighting retrofit can easily reduce lighting electricity costs by 40 to 60 percent. In addition to large energy cost reduction from the base building lighting, most warehouses undergoing lighting retrofits install sensors that completely shut off the lighting in portions of the warehouse that are not in use. Previously, many warehouse owners and lighting specifiers were reluctant to install sensors because they reduced fluorescent lamp useful life. Today, improved technology sensors are available with warrantees not to reduce lamp useful life. New, improved commercial heating systems can provide energy cost savings of eight percent or more over the ASHRAE 2001 building code standards. There are multiple heater technologies suitable for manufacturing facilities, including direct fired gas heaters, unit heaters, and infrared (radiant) heaters. If feasible, the warehouse heater should be mounted on an exterior wall to optimize the roof top solar P.V. space. If a warehouse requires re-roofing the owner should consider a more energy-efficient white roof. Moreover, re-roofing is the ideal time to consider adding more insulation. If the building already had an energy-efficient design and roof the owner may want to consider upgrading to more energy-efficient truck bay doors and windows. 1.Assemble team including Warehouse experts for EPAct tax incentives, utility rebates, lighting, heater, envelope and solar. 13.Celebrate tax enhanced energy-efficient warehouse achievement. As described above there are multiple compelling reasons including energy and substantial tax savings why Illinois area warehouse owners are acting on energy-efficient projects. This is such a widespread phenomenon that market forces will require manufacturers to upgrade just to remain competitive.